Seville us choca-bloc with places to eat: resturants, cafés, tapas bars etcetc. I love food and I’m involved with the tapas, and in the winding streets of Old Town Seville there is always a tapas bar around the corner, hiding in some dank alleyway. You know how in the UK they say you’re never more than 5m from a rat? Well, that’s probably true in Spain, both for rats and tapas bars. You can see the point I’m making. But the thing is, there are so many places to eat that you might end up suffering from Eaters’ Anxiety (EA) which is when you become very anxious that of all the tapas bars, you’re not going to pick the best. You live in fear that wherever you end up going, you could have gone somewhere better. Even though I know can always try somewhere else tomorrow…I still end up fretting. But as we are here for nine weeks we are getting the chance to try a lot of places so I thought I’d share some wisdom. Mostly when we go out to eat, my main focus is the food. In fact, its for this reason that I literally have no photos of any of the food I’ve eaten: when I see it, my fork is usually already in my hand and next thing I know I’ve eaten the whole plate and I’m asking for another look at the menu. 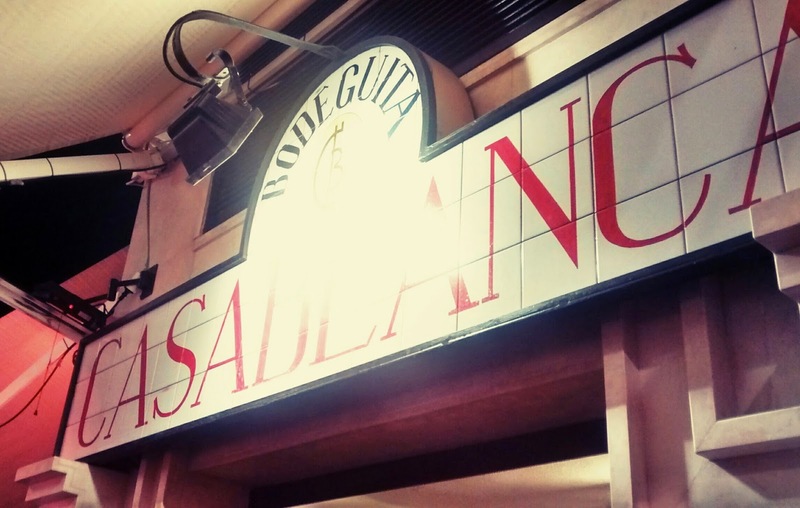 But last night we went to Bodeguita Casablanca where what really stood out was the service. We were worried about finding somewhere that was good and not too touristy as we were at Puerta Jerez, near the Cathedral. But this place had good prices (most tapas 2.50 a portion), was busy, and in the end we chose it because of the range of non-meat options. We ordered a selection of mainly fish-based dishes to share (actually I panicked when the waiter was there and ordered more than we ever imagined we would need). The food was quick, nicely presented and tasty, but the waiter was an absolute babe. More than once I’ve asked for suggestions in bars and the waiter has glared at me and said “everything is good.” which is code for “I hate everything”. But he was very helpful and recommended the fried Cod gratine which was really fresh and delicious. Then he brought us an ‘aperitif’ (which was FREE omg) of this bizarre cold green potato salad, that tasted like Austrian potato salad, and was therefore fantastic. Then to top it all off, my friend really wanted chips with her burger but there were none on the menu and he said it wasn’t possible. Then, without warning, he brought out a batch of fresh chips, also on the house. It was so sweet. What to eat: Pork cheeks, which were incredibly tender came in a rich tomato sauce and sliced potatoes. Not so good: we tried the “house croquettes”, because I am totally obsessed with croquettes, but without being too crude, they tasted like fishy cheesy feet. Bodeguita Casablanca is a good choice if you’re in that area of town and want to eat like the locals. It is only the 304th best in the city, according to Trip Advisor, but I would definitely go again!